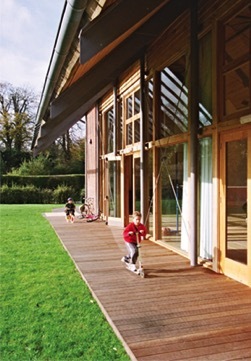 Winner of the Winchester City Council Award for Good Architecture and the 21st Century Halls for England Flagship Award. 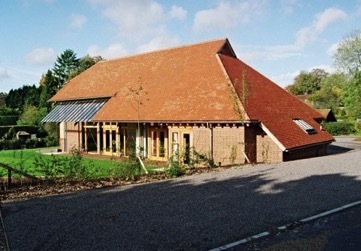 This chance to design a new village hall not only provided the opportunity to stitch back the landscape and fabric of Itchen Abbas, but more importantly, created a catalyst for the growth of community spirit on a broader level. The delightful but derelict site had once been an agricultural engineering factory and was right in the centre of the village, just across from the church and the village pub. 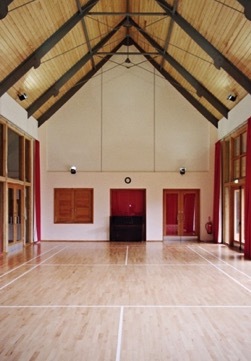 Such an outstanding location merited a landmark building, able to accommodate a wide spectrum of village activities. An additional challenge was the proposal to house a Montessori kindergarten in the new hall. The need to appeal to the rich imagination of a child is an inspirational driver, allowing one to explore relationships of scale, colour and humour - embracing and confronting familiar sensibilities. We gave the Structural Engineer quite a challenge by proposing a slender pin-jointed steel frame which straddled the hall and clearly expressed the hooking of tie rods and winding of tensioning screws. Ingeniously, he made the ceiling into a structural diaphragm which, like an upside down boat hull, afforded exceptional stiffness, superb acoustics and warm reflective shelter. For this building to receive such recognition, and to see it enthusiastically used and loved by the local community is a real delight, not least because the entire project was realised on an extremely limited budget. 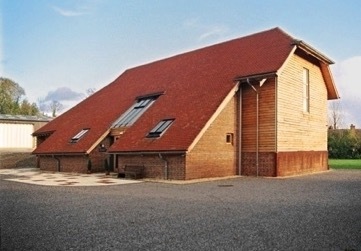 The hall has been a big financial success, with a full booking diary - not only does the building cover its own running costs, but it also provides a valuable source of income for the parish.